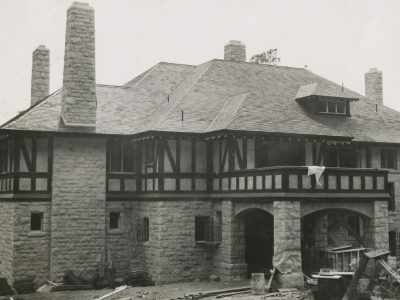 Valerie Green has provided a history of a seldom-seen Tudor Revival-style house that was built in 1922. 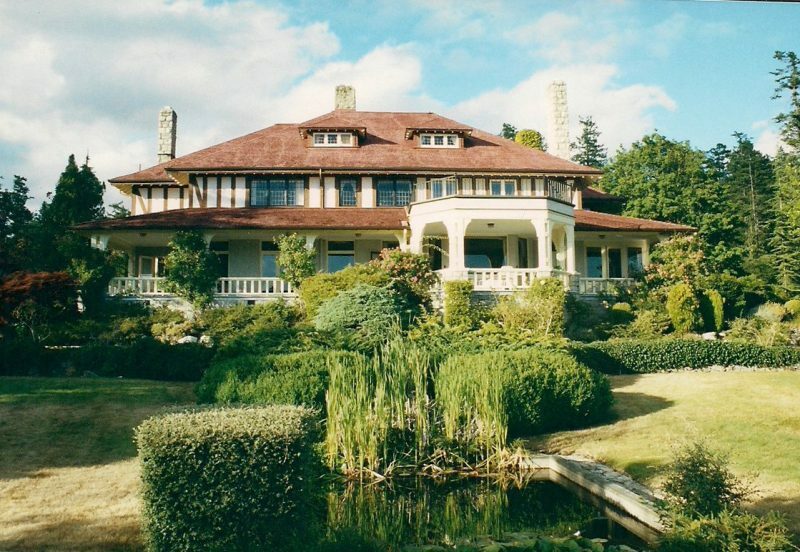 Dunmora is a six-acre estate on the west side of the Saanich Peninsula. Engel & Volkers photo. Ultimately this is a book about a particular house rather than a social class or family, according to reviewer Patrick Dunae. “Dunmora” is the name of an impressive Tudor Revival-style house that was built in 1922. It is located north of Victoria, on the west side of the Saanich Peninsula. Today, the address is 480 Dunmora Court. It is reached via MacPhail Road, which runs off West Saanich Road near Mt. Newton Cross Road. 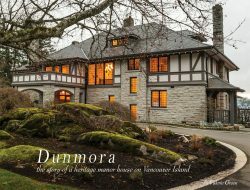 Dunmora: The Story of a Heritage Manor House on Vancouver Island is a building biography that is situated at a place where public history, genealogy, architectural history and social history meet. The cataloguing in publication data provided by Library and Archives Canada indicates that Dunmora relates to the history of British Columbia, and so it does. But there are also elements of British imperial history and recent Alberta history in this book. It is written by Valerie Green, a popular and prolific historian whose previous publications include If These Walls Could Talk: Victoria’s Houses from the Past (Touchwood Editions, 2001) and If More Walls Could Talk: Vancouver Island’s Houses from the Past (Touchwood Editions, 2004). The book was commissioned by the present owners of Dunmora, Steve and Lera Zakreski. As the author acknowledges “serendipity” brought her and the Zakreskis together for this project (p. 105). Their partnership resulted in a coffee table-style book that will interest many readers. But the audience for this book will be segmented. 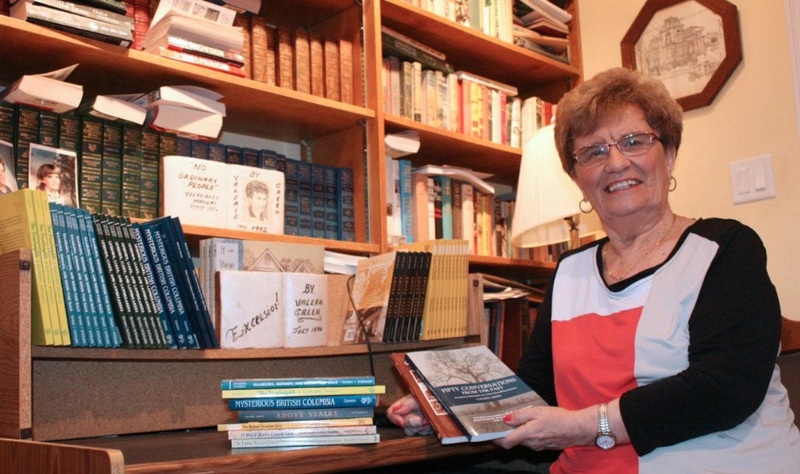 The book is organized chronologically and follows the fortunes of various families who made Dunmora their home. 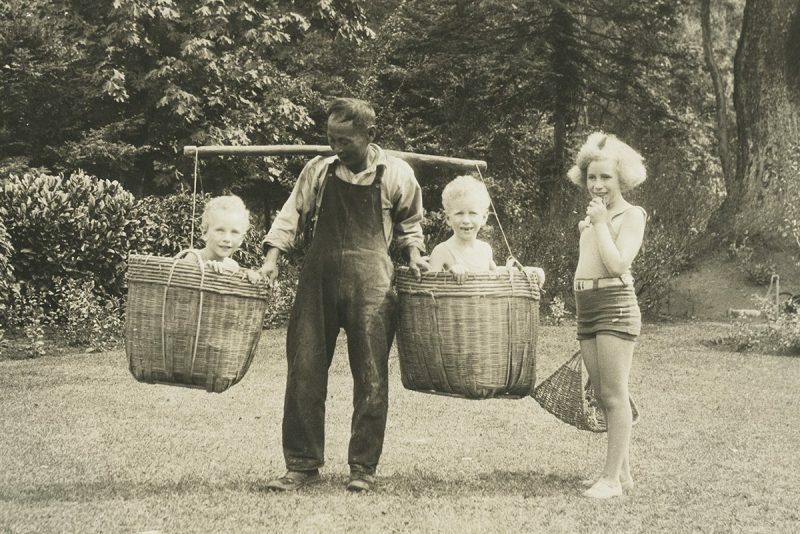 Gerald and Léonie May were the first owners. They owned this place for forty years and an adjacent home, called “New Dunmora,” for another thirty years. Gerald’s wife came from Dorset. Her father, christened Alexander but known as Rex, was a Bavarian. After marrying a genteel Englishwoman (Elizabeth Sheppard), he anglicized his German surname, Frederichs, to Fredericks. Isabel Léonie Fredericks (b. 1901) was educated at Roedean, a prestigious boarding school for girls in England, whilst her father built the family fortune through property investments in Argentina. In 1913, Gerald’s brother, Cyril, married Léonie’s sister, Melita. Their siblings, Gerald and Léonie, attended the wedding. When the two met for a second time in 1920, cupid drew his bow. Gerald, who was 32 years old, and Léonie, who was nineteen, fell deeply in love. Gerald “became smitten by her beauty and intelligence….” (p. 18). They were married in March 1921 in London, spent their honeymoon in Lynmouth, Devon, and before the end of the year, they were in Victoria. As they sat on a beach one day Gerald asked his new bride where in the world she would like to live. She knew she would be happy with him anywhere so when he suggested Victoria on Vancouver Island in Canada, she readily agreed. Gerald remembered Victoria from having stopped there during his school years travelling back and forth between Hawaii and the United Kingdom (p. 20). The decision probably involved more than a whim, but it was a good choice for people of their social standing and background. 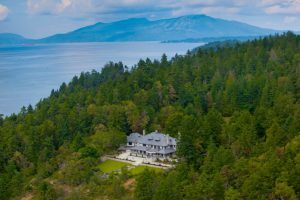 They purchased sixty acres overlooking Saanich Inlet for about $12,500 from “a Mr. Pichon, a Frenchmen who ran a hunting/fishing business in Victoria” (p. 11). [Charles Louis Pichon was a prominent sportsman and partner in a firm of gunsmiths in Victoria.] The Mays commissioned the dean of Victoria’s architects, J.C.M. Keith, to design a residence on the site. The building contractor, D.W. Burnett, was also first class. The final cost of designing, building, and furnishing this large [10,000 square foot] structure is not stated, but it must have been substantial. The Mays enjoyed a manner of living reminiscent of upper-class households before the First World War. They employed Chinese cooks and gardeners; they hired British housemaids and nannies for their three children. 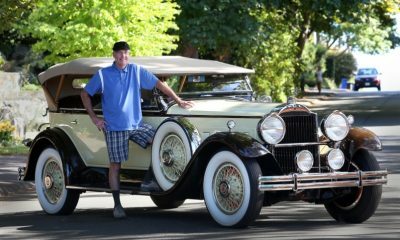 During the 1930s, they added a stone terrace and garden pool to the property, purchased a McLaughlin Buick roadster, and sent their children to boarding schools in England. During the Second World War they provided hospitality to Royal Air Force chaps who were stationed at nearby Patricia Bay airfield. One of these chaps practiced bombing drills over Saanich Inlet (p. 45). They also entertained the Lord Mayor of London, who was invited, with his family, to take refuge at Dunmora and escape the bombs raining down on London during the Blitz. “The Lord Mayor was said to be grateful but graciously declined their offer, feeling he should remain in London at this crucial time” (p. 44). 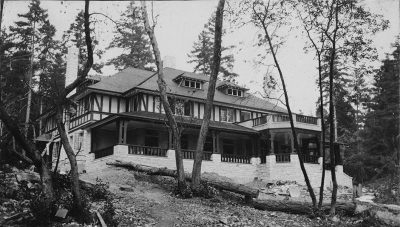 Léonie May resided in New Dunmora until 1972, when she moved to Salmon Road in Central Saanich, to a smaller house that she called Dunevan, a name that recalled her childhood home in Weybridge, Dorset, England (p. 26). 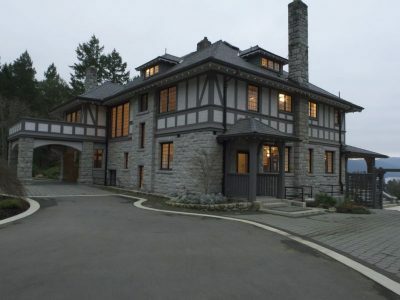 In bestowing a name on her new residence, Mrs. May was perpetuating a tradition among the well-born British and middle-class anglophile residents on Vancouver Island. 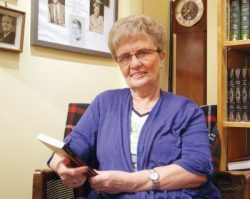 In 1961, a couple from Lethbridge, Alberta, purchased Dunmora with the intention of turning it into a private school for boys, along the lines of Brentwood College. When the municipality refused to re-zone the property for this purpose, it was sold in 1963 to a wealthy couple, with local connections, who re-established it as a gracious family home. Their sons boarded at Shawnigan Lake School, a few miles away, and on holidays would return home on the Mill Bay-Brentwood ferry. An Edmonton financier (Donald Cormie) bought the property for $125,000 in 1969 and owned it until 2002. He used it as a family vacation home, playground, and meeting place for partners in his Alberta-based enterprises. For their comfort he installed a hot tub “which was so large it had to be brought by helicopter to be set out in the rocks far away from the house and overlooking the incredible view down the Saanich Inlet” (p. 72). “It soon became a special part of all the business meetings,” notes Green. “Late night cocktails in the hot tub became legendary!” (p. 73). After the financier’s business collapsed, Dunmora was bought by a pension fund consultant and his wife who had prospered in the Victoria real estate market. They spent a great deal of money on renovating the house and landscaping the grounds. They installed a fountain in the garden pool that Gerald May had built in the 1930s. “Eventually, however, the house simply developed into a ‘money pit’ and the money began to run out” (p. 84). The new owners’ marriage floundered and in 2010, after several years of litigation, the Dunmora property was sold to a local developer, Grant Rogers. He is one of the heritage heroes of this narrative. Having entered into a Heritage Revitalization Agreement with the municipality, he spent several years renovating and upgrading the house in a sensitive way that retained the Arts and Craft style of the structure. “To take something such as Dunmora, with its wonderful heritage value … and history and make it valuable for a new family to live in has given me considerable satisfaction,” Rogers remarked in 2013 (p. 92). In May 2015, Dunmora was sold in for $5.3 million dollars. At the time, it was a record price for a residence in this region. The new owners, Stephen (Steve) and Valeriya (Lera) Zakreski, came from Calgary. Mr. Zakreski was born in England and spent his early years in Southampton. His father had served in the Polish squadron in the Royal Air Force and subsequently qualified as an aeronautical engineer. In the mid-1950s, the family moved to Toronto where his father worked on the Avro Arrow project. Steve Zakreski also trained as an engineer before establishing a very successful air conditioning business in Calgary. While he and his wife flourished financially and socially in Calgary, they were drawn to “the call of the ocean” and the temperate, salubrious climate of southern Vancouver Island (p. 96). Valerie Green emphasizes that the new owners of Dunmora regard themselves as “stewards” of a property that has “both architectural and historical significance for the region,” and that they appreciate the context and legacy of the property. In an interview with Green, they remarked: “Both the building and the surrounding landscape represent a creative work of art by a gifted architect and the original owners. They built an iconic property which represents a point in time when the British influences in the region were strong….” (p.97). The Zekriskis deserve kudos for commissioning this book and making it available through Hancock House Publishing. Valerie Green also deserves credit for weaving many different genealogical threads and historical events into a coherent and entertaining narrative. Dunmora will be a delightful souvenir for the current and previous owners of this fine old house and for their family members and friends. Doubtless, the book will evoke many fond memories. Social historians will enjoy this book as a micro-history that illuminates larger historical themes. But the book also raises some questions, especially in the most interesting chapters that describe the early years when Dunmora was owned by Gerald and Léonie May. Green might have probed more into the circumstances that prompted Gerald and Léonie May to emigrate. The story of a whimsical decision by a honeymoon couple in Devon to move to Vancouver Island is lovely. It’s the kind of romantic story that descendants would cherish. But there were doubtless other factors at play. 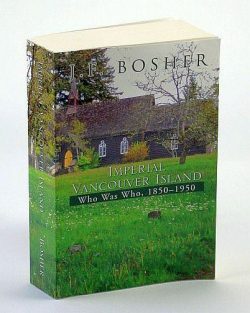 George and Léonie May were part of that anglophile, British Empire-minded community that Professor John Bosher describes admiringly in his compendium Imperial Vancouver Island: Who Was Who 1950-1950 (Writersworld, Woodstock, Oxfordshire, UK, 2012). Well-born Britons like the Mays were usually part of a chain migration. They may have had friends and possibly relatives already settled when they moved to Victoria in 1921. Otherwise, how did George know about the Pichon property? Who introduced them to the architect, James Keith? Léonie’s parents, Rex and Elizabeth Fredericks, also became links in this chain when they moved to North Saanich and into a house they named La Quinta (p. 26). Perhaps the name evoked their time in Argentina, a country that, because it attracted such a large amount of investment capital from the UK, was sometimes regarded as an “informal” part of the British Empire. Surprisingly, George May is not included in Bosher’s biographical compendium. Born in North Saanich and raised in a cultured English family, Professor Bosher probably knew the May family and was aware of their estate, Dunmora. In any case, George May fraternized with the “Imperials” whom Bosher admires. May socialized with them at the Union Club in Victoria and entertained them at home. Norman Yarrow, who is included in Bosher’s book, was a frequent visitor. The son of Sir Alfred Yarrow, who founded the famous Glasgow shipbuilding firm, Norman Yarrow was manager of Yarrows shipyard in Esquimalt. 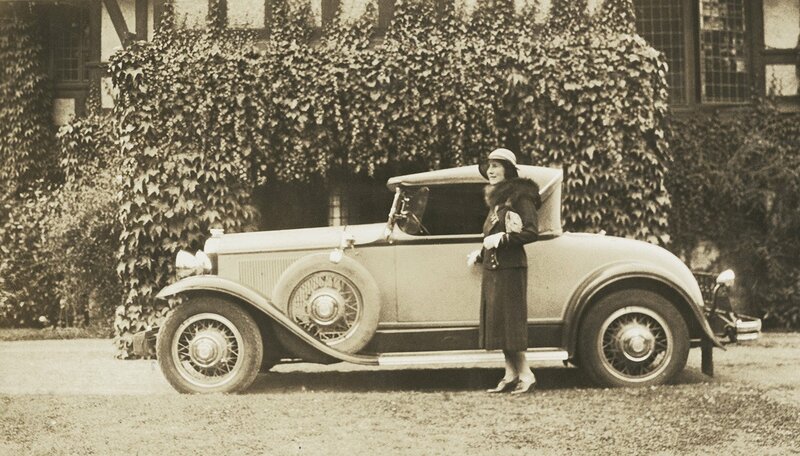 Green mentions that “Norman would often drive out to Dunmora in his 1930 Packard Touring Car…” (p. 37). That vehicle, since restored, is a link that connects descendants of the May and Yarrow families to this day (p. 39). But ultimately this is a book about a particular house rather than a social class or family. In her concluding chapter, the author describes “Dunmora today — restored and renovated to modern-day standards,” as “an outstanding example of heritage restoration at its best. Dunmora’s historical value has been preserved and protected to ensure its use for future generations” (p. 102). This chronicle, Dunmora, is also admirable for its achievement. Valerie Green shows how a very localized study, when placed in context, can illuminate larger narratives about families, places, and historical events. Patrick Dunae is a Victoria-born historian who has taught courses on BC history at the University of Victoria (UVic) and Vancouver Island University (VIU). His early publications dealt with genteel British emigrants who came to Western Canada (like the first owners of Dunmora) and with underprivileged British child emigrants who came to Vancouver Island under the auspices of the Fairbridge Society in the 1930s. See Gentlemen Emigrants: From the British Public Schools to the Canadian Frontier (Douglas & McIntyre, 1981) and “Child emigrants, child welfare and the Fairbridge Society in British Columbia, 1931-1951,” in Child and Family Welfare in British Columbia. A History, Diane Purvey and Chris Walmsley, editors (Calgary: Detselig Press, 2006). Now retired from teaching, Patrick retains an affiliation to UVic as an adjunct associate professor and to VIU as professor emeritus. He is a past member of the City of Victoria Heritage Advisory Panel and presently serves as a director of the Friends of the BC Archives Society. 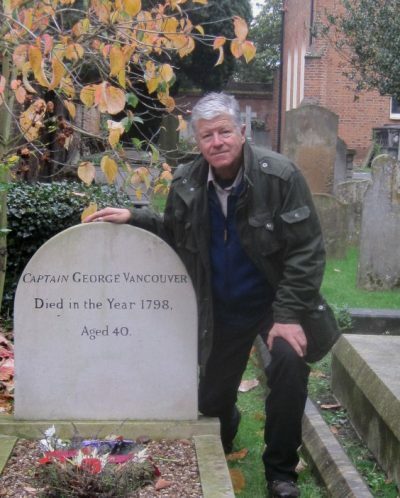 Not long ago, on a visit to England, he attended the grave of Captain George Vancouver.